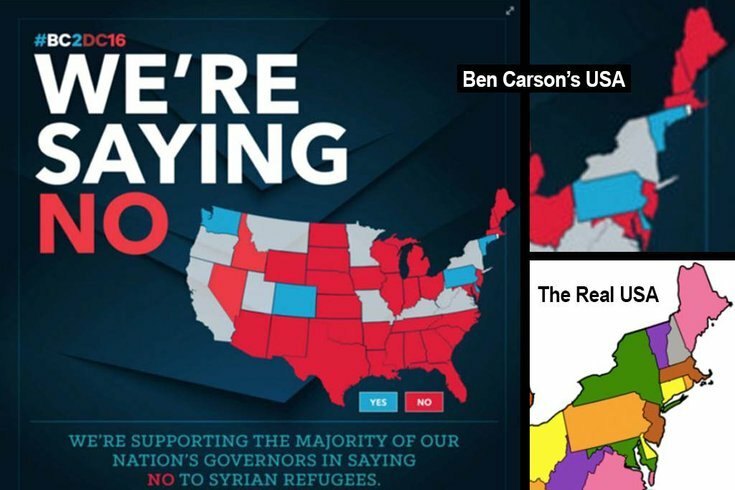 A map of the United States put out on social media by the Ben Carson campaign took a creative approach to the geography of New England. It has since been corrected by the campaign. Some people are so worked up about the “OMG Syrian Refugees Coming to America” issue that they can’t even see straight. Like Republican presidential candidate Ben Carson, for instance. Already under fire for perceived foreign-policy shortcomings, he’s now facing questions about his domestic prowess. On Tuesday night, he (read: someone with the campaign, prolly) posted an U.S. map on his Facebook and Twitter accounts. In a since-fixed graphic titled “WE’RE SAYING NO,” some states are red, others blue and some kinda grey. “We’re supporting the majority of our nation’s governors in saying no to Syrian refugees,” it reads, indicating that red = no and blue = yes. Herein lies the rub: The map (someone close to) Carson posted doesn’t accurately reflect America. Sure, some are saying yes and others are saying no, but the New England states are situated on the “Carson” map absolutely nothing like they are on the “real, actual, legitimate” map. I mean, Maine and New Hampshire are totally next to one another, and Massachusetts is totally beneath them. They got that right, as well as the existence of Rhode Island. What about Connecticut and Vermont, you ask? Your guess is good as mine, which holds that Connecticut and Vermont were kinda merged in a fashion that turns Connectimont into something which looks like a gun with a really boss shoreline.